First let me say, I’m not a “germ-a-phobe” by any stretch of the imagination. You won’t find antibacterial soaps or hand sanitizes in our home. We just use plain old soap and water to wash our hands with and, for the most part, soap and water to clean with. Rarely do I feel the need to break out natural cleaners and disinfectants such as vinegar, rubbing alcohol, or hydrogen peroxide. 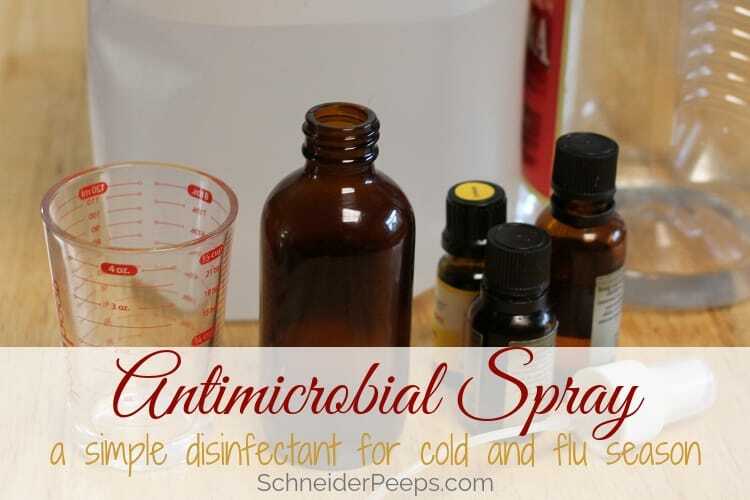 However, there are times I like having a homemade antimicrobial spray available. For instance, when someone is sick and is lounging on the couch. The couch is hard to wash so I’ll spray it with homemade antimicrobial spray when the sick person relocates to their bed. I also like to use it on surfaces when that are touched a lot such as light switches and doorknobs when we have an illness visiting our home. It’s easy to spritz each light switch and doorknob several times a day while we’re trying to keep the illness from spreading. 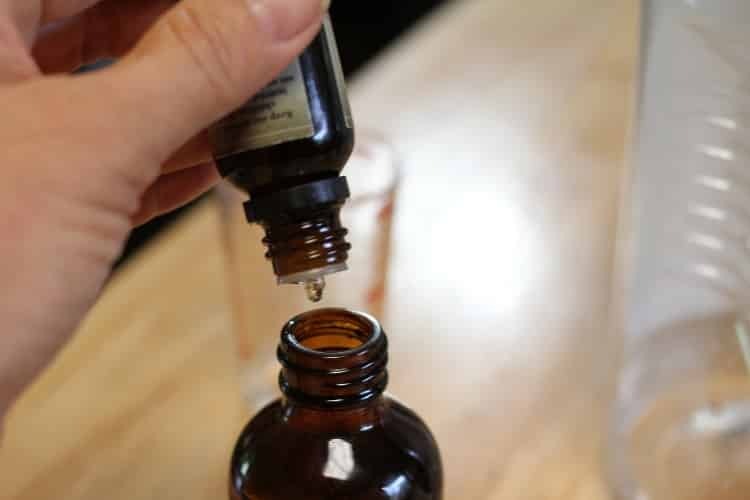 I also keep elderberry syrup, cough syrup, fire cider, and several other home remedies, such as homemade vapor rub on hand so we have them ready when we need them, instead of scrambling around to make them at the last minute. I’ve done this for years and if started right away, they work like a charm. This spray smells good enough to also use as a linen spray on things that don’t get washed every week, like curtains. I know many people have strong opinions about germs – both those who think we should use anti-bacterial everything all the time and those who think we should never use anti-bacterial anything ever. 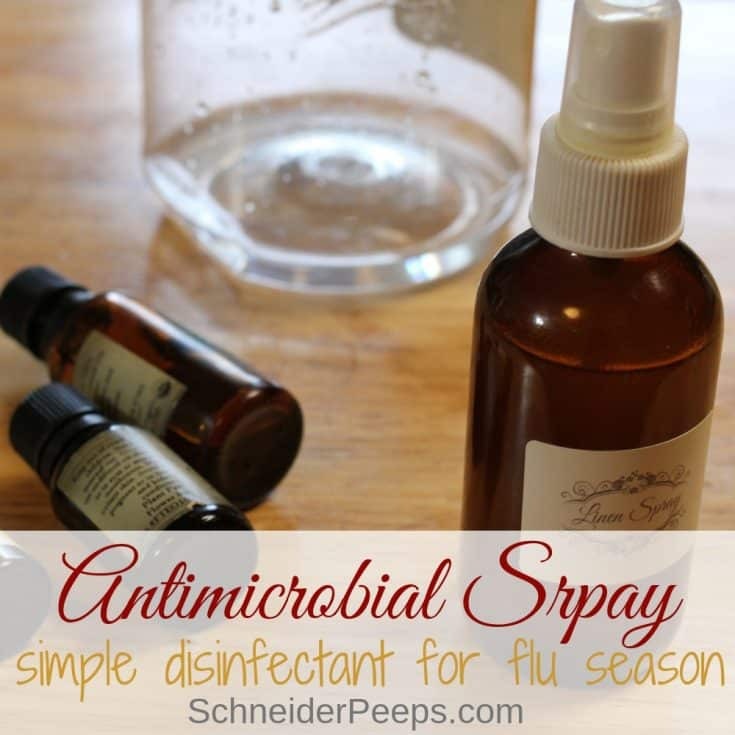 And while I would agree that, for the most part, antimicrobial sprays and cleaners are over used in our society and this, along with antibiotic overuse, has contributed to resistant bacteria…which is not good. But I also believe that there are times we need to protect our family and the judicial use of natural antimicrobial products helps with that. This is not something we should be using every day. And even though these ingredients are natural they can still contribute to the resistant bacteria problem if over used. This spray is so simple to make and you can use the basic idea to make any kind of room spray or linen spray. I like to use a combination of cheap vodka and distilled water as my base. You can even make it right in the bottle. Then add the essential oils, put the sprayer back in the bottle, and give it a shake. It’s ready to use. 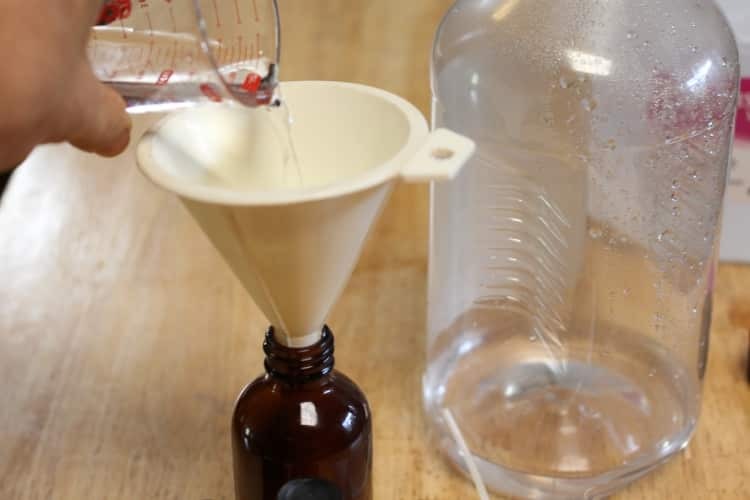 The vodka will help disperse the essential oils but it doesn’t dilute them, so give it a quick shake before you use it each time. I have some handy herbal and essential oil worksheets for you to help you keep track of all the fun things you’re learning as you put together your homemade apothecary. You get them emailed to you by filling out the form below. This will make about four ounces and it is best if you put it in a colored jar as essential oils can deteriorate in the light. Mix it all together and shake well. Shake well before using. I put it in a spray bottle so I could just spray the doorknobs, light switches and other high traffic areas. Can we talk about essential oil safety for a moment? Even though I’ve been using a few essential oils for almost 20 years, I’m concerned about the essential oil bandwagon going on right now. There are sites popping up all over the place and it’s hard to know what information is correct and what isn’t. We live in a culture that thinks “If a little is good, then more is even better.” THAT is not true of essential oils. More can cause problems. If you’re interested in studying herbs and essential oils I highly recommend the courses at The Herbal Academy. They also have a very reasonably priced membership program called The Herbarium which is full of herbal and essential oil information you can trust. What are your secret weapons for surviving the flu/cold season? Thank you for this recipe! 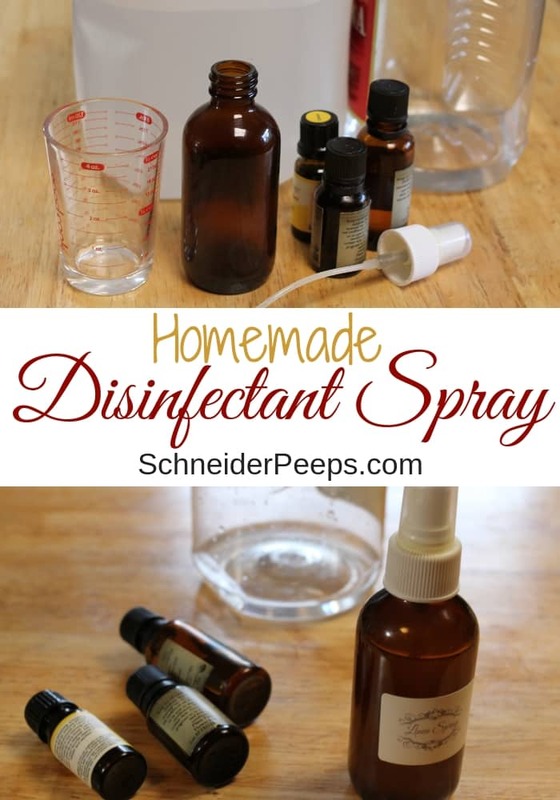 It has become obvious that my homemade sanitizer needs a boost, since my family just recently got over having the flu! I blame it on my husband getting the flu vaccine, which has always given us or our children the flu, without fail. I’ll be making this in the morning! You’re so welcome. My husband has to get the flu shot since he works for hospice but the rest of us never do. We had the flu last year during Christmas, it was miserable. This year, I’m stepping up my game. Do you think I could use something other than the alcohol, Angi? I don’t have any and I’d rather not buy any – maybe I could just leave it out? Rubbing alcohol or hydrogen peroxide? More water? Yes, you can use rubbing alcohol or witch hazel. I don’t know about hydrogen peroxide. The alcohol and witch hazel help with the essential oils mixing and staying mixed. Angi, I appreciate your comments about EO use. This is an area I am new to, and you are right, there is so much conflicting info out there. I grabbed the Healthy Living bundle last fall, and am getting ready to do the Vintage Remedies ecourse. May I also recommend http://www.aromahead.com/ and http://www.everythingessential.me/ as resources for you and the rest of your readers? They ‘may’ be slanted to a particular brand of oils, but the information provided is very informative. Being a nurse, I am well aware that even ‘natural’ things can have side effects. I also subscribe to the ‘less is more’ school when it comes to using EOs. There are many good, reputable dealers of EOs, you don’t necessarily need to join one of the MLM companies. The caveat with that is that if you intend to use oils internally, make sure that your supplier has the highest grade oils backed with scientific studies…several companies will tell you their oils are not for internal use…I’m still not sure about this myself, but topical and aromatic use are a part of our daily lives now. Also, just out of curiosity, does your ‘blanket’ disclaimer on your site cover each and every one of your posts? I’m considering starting a blog, and wonder if a ‘blanket’ disclaimer works or if I would need to have a disclaimer in any post regarding alternative practices? Thanks for the recommendations I’m excited to check those out. Like you I’m not brand loyal, I think there are several high quality brands to chose from. As a nurse, you will love the Vintage Remedies course (at least I think you will). One think I tell my children is that if it’s used medicinally, it’s medicine and should be treated as such. I haven’t decided if we’ll ever use EOs internally (other than toothpaste) as I prefer to use the whole herb internally. If I do decide to use them internally it will only be for short term issues and only when I’m not getting results with whole herbs. The blanket disclaimer covers all my posts since it shows up on every page. Some bloggers do a disclaimer on every post and I might wind up doing that in the future. If you do start blogging let me know, I’d love to check out blog out. Angi, Thanks for the recipe. I really appreciate your openness about the safety of EOs. You are right, it can be confusing and there are so many companies who don’t have quality oils or information about their use. I clicked on a couple of your links and was glad I did. Thanks for sharing your wisdom. You’re welcome, Rhonda. This is an area that I am really passionate about and yet find myself having to bite my tongue over and over. I’m excited to be learning more about herbal and EO use this year. 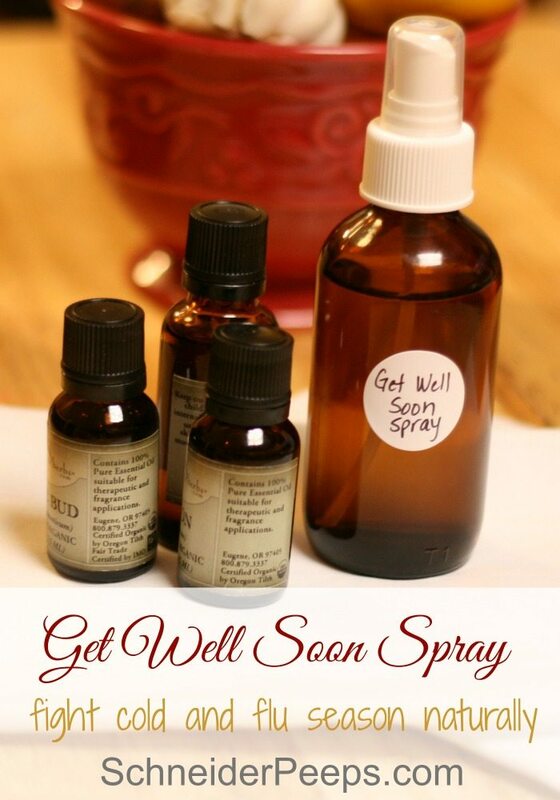 What a brilliant idea a “Get Well Soon” spray is! Especially since the flu is going around and you may want to help your friends but aren’t sure how. Pinning this idea and I know for sure I will be making this blend soon rather than later. I am extremely sensitive to odors. Essential oils often give me a headache, nausea, and lip tingling. This is just from smelling them on someone else or a diffuser running. They are not for everyone. Hi Linda, I totally agree. Essential oils are not for everyone and I would never advocate people diffusing oils in a public place. I struggle with just going down the laundry aisle at the grocery store or sitting beside someone who is wearing perfume.